Question #1: This is a fascinating idea. How come I’ve never heard of it before? Answer #1: The idea behind Child IRA as discussed within the context of the book first appeared in the article “What Every 401k Plan Sponsor and Fiduciary Should Disclose to Employees: How to Retire a Millionaire (Hint: It’s Easier Than You Think),” (FiduciaryNews.com, February 25, 2014). A spreadsheet accident led to a follow-up article, the first to mention the phrase “The Child IRA.” The almost penicillin-like serendipity led to the publication of the article “This idea will solve the retirement crisis, guaranteed!” (BenefitsPro, February 26, 2014). It quickly became apparent The Child IRA could easily obviate the need for Social Security. This led to the article “It’s time we create a Child IRA,” (Benefit Selling, April 2014). Finally, the entire notion of The Child IRA was fleshed out and repurposed to become Appendix V in the book Hey! What’s My Number? – How to Improve The Odds You Will Retire in Comfort, (Christopher Carosa, 2014, Pandamensional Solutions). 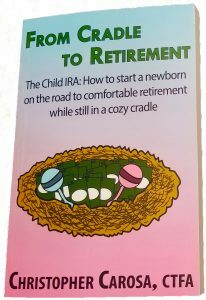 Since then, and especially given the publicity with the launch of From Cradle to Retirement’s Kickstarter campaign, we’ve seen plenty of excellent questions about how The Child IRA works. We’ve distilled the most popular questions here. Question #2: I like it! The Child IRA is a tremendous way for me to introduce a valuable tool to my clients. I do wonder, however, if it’s a good idea to “guarantee” a person’s retirement. In some ways worrying about our futures make us better as it’s an incentive to become more engaged in our careers and engagement is healthy. How would the Child IRA impact a person’s ambition? Answer #2: First, like any other IRA, there are no “guarantees” regarding what the future might look like, there are only probabilities. The calculations assume an average growth rate of 8% – which is 3% below the historical average growth of 11% a year (that’s enough to account for inflation, fees, and whatever else you want to account for). Then there’s this mathematical reality: The $2.5 million 70 years from now merely replaces Social Security – the child will still need to save for retirement as an adult in order to secure a comfortable retirement. If that doesn’t answer the “ambition” question, consider this. There’s this behavioral trick bartenders do to encourage tips: They always place a few dollars in the “Tip Jar” before the customers arrive. Seeing money already in there encourages patrons to add to the kitty. Think of this Child IRA as the “Tip Jar.” Once the child sees the money accumulating year after year, it is likely to trigger a behavioral response consistent with bar patrons: They’ll be more likely to save more! Question #3: I also wonder if people would be more apt to tap into funds that they didn’t save themselves? Answer #3: Oddly enough, the From Cradle to Retirement contains interviews with quite a few “children” who are now adults and whose parents established IRAs for them. Most of them seem to value the “lesson learned” and are even interested in starting Child IRAs for their children. One person, who had a Roth instead of a traditional IRA, did use some of the money to pay for graduate school. This is the issue with using Roths, but not with using traditional IRAs, since the Roths allow for non-penalty withdrawals for education. In both cases, withdrawals normally aren’t allowed until age 59½. Question #4: If parents learn that their children did use the money for frivolous purchases, how would they react and what impact would this have on the relationship they have with their children (i.e., “I can’t believe little Billy spent his retirement on a Corvette, what a jerk!”)? Question #5: I watched the video on the Child IRA. It’s a great concept, but a child can’t open an IRA unless they have earned income. The video talks about putting money into a Child IRA at birth through age 19, but the child normally can’t work until age 16 and receive a W2 in order to contribute to an IRA or a Roth IRA. Can you give me a little more detail on how that concept is to work based on that fact? Answer #5: This is a great question as well as a common misperception. It’s perhaps the single greatest reason why we haven’t seen many people taking advantage of the Child IRA for their young children. In fact, children below the age of 16 do work and earn income. Yes, babysitting and mowing the neighbor’s lawn counts as earned income, but children have real jobs, too. You don’t think all those child actors work for free, do you? In addition to certain industries that regularly employ children under the age of 16, family owned business generally have no age restrictions when it comes to employing their own children. From Cradle to Retirement – The Child IRA – How to start a newborn on the road to comfortable retirement while still in a cozy cradle explains how to establish a Child IRA today in precise, easy-to-understand (and duplicate), detail through actual real-life case studies, interviews with industry professionals familiar with the ins and outs of hiring children, along with expert guidance from financial professionals versed in the mechanics of establishing Child IRAs.